School facilities matter. Building conditions may not always be seen as the most important of the myriad issues facing public education, but they are a fundamental concern and must be addressed. We have for too long ignored the many negative effects that deficient building conditions have on educational quality. Until we ensure all students have access to school buildings that are healthy, safe, comfortable, and dry, we can't hope to adequately protect the well-being of our students and staff, recruit and retain teachers, or provide high-quality education to all. In recent years, the Detroit Federation of Teachers has protested not only a chronic lack of resources in Detroit's public schools but also the decrepit state of the district's school buildings.1 Educational staff and others have cited black mold, rodent and insect infestation, asbestos contamination, water damage, disintegrating walls, and lead paint, among other issues, as threats to the safety, achievement, and morale of their children and the larger school community. While varying in scope and degree, the condition of Detroit's public schools sadly mirrors the physical deterioration of public schools nationwide. But children of color and those from high-poverty communities are most affected. From the crumbling and overcrowded school buildings of Newark, New Jersey's East Ward,2 to Philadelphia, which boasts some of the oldest school buildings in the country,3 America's postindustrial cities have garnered international attention for the accelerated decline and neglect of their educational infrastructure. Since 1985, I have served as the director of environmental science and occupational safety and health for the Philadelphia Federation of Teachers (PFT) Health & Welfare Fund. The Health & Welfare Fund is a freestanding PFT-affiliated organization that was established in 1974 through the union's collective bargaining agreement to provide supplementary benefits and related support to promote the health, safety, and well-being of all PFT-represented employees in the School District of Philadelphia. In my role with the Health & Welfare Fund, I review information and data, as provided by the district, about environmental exposures and related building conditions; conduct school-site visits and evaluations to assess mold, asbestos, lead, and a range of other environmental hazards;* and work with school district officials and educational staff to find practical solutions to ensure safe building conditions. While I could provide a laundry list of the environmental facility deficiencies I've seen throughout my career, this article primarily focuses on what we have found are the best and most effective ways to improve conditions in our schools. Before I discuss the approaches to ensuring safe building conditions that the PFT and the school district have attempted to work on together, it would be helpful to provide some background on the state of our country's school buildings. A 1995 report by the U.S. Government Accountability Office found poor public school conditions across the country and estimated that the nation's schools required $112 billion to complete all the repairs, renovations, and modernizations necessary to restore facilities to good overall condition. This report also concluded that 28 million students attended schools nationwide that needed one or more building features extensively repaired, overhauled, or replaced, or that contained an environmentally unsatisfactory condition, such as poor ventilation. One of the most telling conclusions was that 15,000 schools were found to have air unfit to breathe. Studies have concluded that low-income and minority children are more likely to attend schools that are in poor physical condition.7 The 21st Century School Fund reported that from 1995 to 2004, the country's most disadvantaged students received about half the funding for their school buildings ($4,800 per student) as their more-affluent peers ($9,361 per student). Since 2010, I've conducted more than 500 site evaluations of unsafe school building conditions in Philadelphia. I've documented more than 5,000 individual deficiencies in more than 140 separate buildings. I've seen classroom desks, chairs, floors, and books covered with lead-containing paint chips and dust. I've seen damaged asbestos insulation material in educational spaces, and extensive, visible mold growth covering ceilings, walls, and floors in classrooms, bathrooms, libraries, and cafeterias. A number of schools have unguarded radiators and uninsulated steam pipes accessible to children, which present a burn hazard. I've also documented extensive asthma triggers, including rodent and insect infestations, droppings and nesting materials, elevated moisture and humidity, and dust from damaged plaster and sheetrock walls and ceilings. As you can imagine, such deficiencies have been responsible for numerous student and staff illnesses across the district, leading to increased absenteeism and lost instructional time. These unhealthy conditions also have led to the loss of much-needed instructional space and educational materials, including books, computers, and musical instruments. Additional financial consequences ensue when repairs are delayed for months or even years and small fixes become bigger and far more expensive to perform. One of the things that makes Philadelphia unique is that the teachers union and its Health & Welfare Fund have developed, and devoted significant resources to, an independent, professional Indoor Environmental Quality (IEQ) program. Since the 1980s, the PFT Health & Welfare Fund has acted as a "watchdog," overseeing and verifying district activities with respect to school building health and safety. The PFT Health & Welfare Fund has also engaged federal agencies (such as the National Institute for Occupational Safety and Health [NIOSH]), local governmental agencies (including the Philadelphia Office of the Controller), public advocacy groups, parent organizations, and others in efforts to improve school conditions. Without these coalitions, and absent district buy-in, the challenges to ensuring safe school buildings are even greater. In 2010, after the union recognized the lack of comprehensive and systematically collected data regarding facility conditions and related IEQ impacts, union and management health and safety representatives began working together on a comprehensive IEQ-facility condition, evaluation, and documentation system. It involved union and district representatives agreeing to notify each other about all health and safety activities conducted in schools, including environmental inspections and evaluations. To the extent possible, we perform inspections and evaluations together. We document our observations and share quantitative data. We also typically interview the school principal, building engineering staff, and the PFT building representative, in addition to as many building staff members as possible. Information collected should be shared in a jointly developed report created for each school. These school-level reports include detailed room-level observations, findings, and, most importantly, recommendations. The idea is to avoid previous situations where separate evaluations resulted in arguments about the state of building conditions, impacts, and the status of repairs. Hopefully, data and lessons learned from on-the-ground evaluations can then be used to inform districtwide improvements. These reports represent the district's first labor-management attempts to conduct systematic joint assessments. The involvement of the union in the inspection process enables broader and more open communication and participation by building staff, facilitates documentation, and ensures issues are addressed in a comprehensive manner. The reports' careful detailing of problems at the room level and designation of time frames for needed work, which are included in the spreadsheets, are especially valuable. They also note whether problems are ongoing or repetitive. A new computerized maintenance management system is currently being rolled out to handle work orders in the school district. This system has great potential not just for tracking work but for capital planning, priority setting, and improving communication with school staff. One welcome feature is that each complaint generated will be followed up with an e-mail on its status to the person (e.g., the teacher) who registered it. In addition to school-specific dashboards, reports are created in which the school-specific information is aggregated into an IEQ Master Dashboard that is updated on a weekly basis. 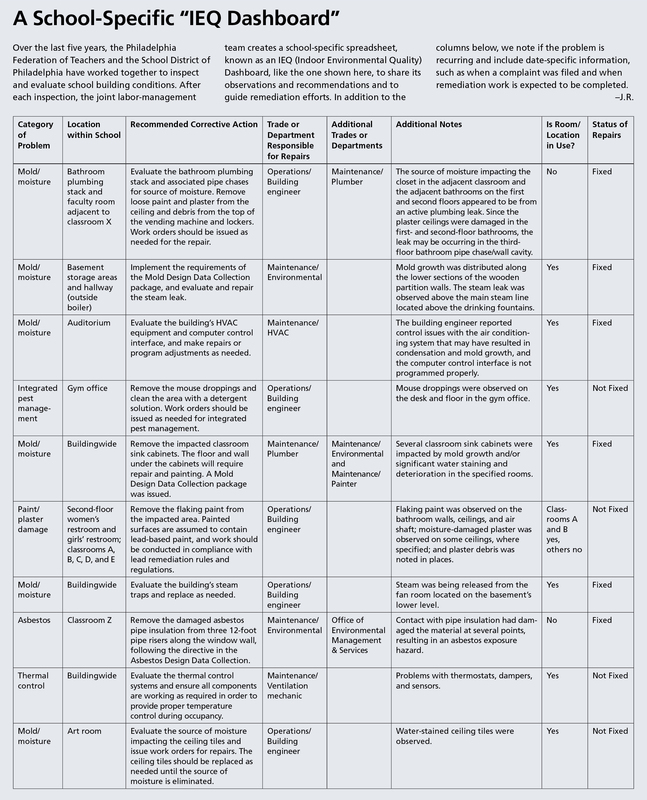 These reports serve as a comprehensive record, at the district level, of documented school building condition deficiencies, proposed recommendations, and remediation time frames. This process is just one element of an effective, working partnership. In 2011, PFT health and safety representatives attended the U.S. Environmental Protection Agency's Indoor Air Quality Tools for Schools National Symposium with several school district managers from facilities and operations and environmental management services. We jointly presented our challenges and described our collaborative efforts, including the IEQ Dashboard. We also discussed what could and should be done moving forward. Representatives from NIOSH also attended this symposium, recruiting school districts, unions, and school staff to participate in research efforts aimed at assessing and evaluating mold, moisture, and dampness issues in schools. PFT and Philadelphia school district officials agreed to participate. This work resulted in major NIOSH studies in the Philadelphia schools beginning in 2011, including a soon-to-be-released dampness, moisture, and mold study of 50 elementary schools. 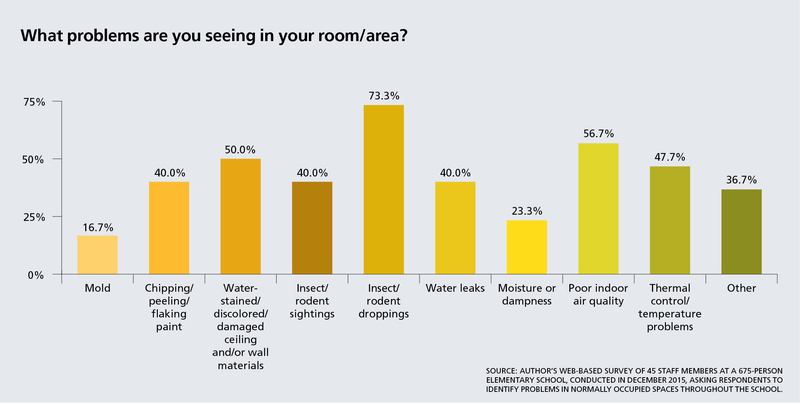 This study involved identifying physical damage to walls, ceilings, floors, and other classroom components from water, moisture, and mold in 8,000 rooms. Also, health survey questionnaires were distributed to more than 4,000 staff members, dust samples were collected for bacteria and mold, and air quality measurements were taken in 500 individual classrooms. As the largest study of its kind in the United States, it can yield important information about all school building conditions, not just those in Philadelphia. In a few elementary schools where building conditions were considered to be interrelated and widespread, we developed school-based teams, called Environmental Action Teams (EATs), in an attempt to systematically resolve issues and facilitate improved communication and collaboration. EATs are initiated at schools with multiple and complex building problems that have been verified through joint labor-management inspection and that often require capital improvement and environmental remediation work. These school-site teams have been highly effective at identifying and resolving problems collaboratively and efficiently. EATs generally consist of eight to 10 members, including the principal, educators, maintenance and custodial staff, district managers who oversee school maintenance (including representatives from capital programs and environmental management services), and PFT environmental science representatives. EATs develop comprehensive inventories and "punch lists" of environmental and building condition deficiencies and concerns in their schools. This process is collaborative, coordinated, and ongoing, with a goal of documenting deficiencies and setting priorities, time frames, and responsibility for action. For instance, one elementary school built in the 1930s had major steam leaks in multiple areas of the building. The temperature was impossible to control: some areas were excessively hot, while other rooms were freezing, prompting staff and students to wear coats and hats indoors. The steam leaks had resulted in significant damage to asbestos insulation materials and to lead-painted walls and ceilings. Such leaks had also caused mold growth, requiring costly environmental remediation, and major damage to wood flooring, furnishings, and educational materials. In addition, unrelated construction work was taking place at the school and causing dust and disruptive noise inside the building. Teachers brought their concerns to the building representative, who contacted me. I first called the school district's environmental department. Soon after, an official from that department met me at the school for a joint inspection. We then met with the principal, the building engineer, and the PFT building representative to draw up a comprehensive punch list of issues and concerns. We decided to establish an EAT at this school because the problems were so extensive and interrelated. The team meets once or twice a month. We immediately began the process of addressing asbestos and mold damage, as required by law and/or agreements between the union and the district. Areas where asbestos or mold damage was documented were kept off-limits until that remediation occurred. Then we fixed the active steam leaks, starting on a Friday and continuing throughout the weekend, when the school was closed. That way, when students and staff returned to the school on Monday, there were no more active steam leaks or visible contamination from mold or asbestos. Buckled flooring was addressed next. That's typically a several-day process that requires a team approach. Damaged flooring was identified in the principal's office, multiple classrooms, and other areas throughout the school. Before bringing in the carpenters, we identified which rooms had to be unoccupied to repair their floors and figured out with school staff where to move students, how to phase in that work, and where to create "swing space." Thanks to EATs, school staff have much more control over construction activity, and we all work together to minimize any disruptions to teaching and learning. Often, without an EAT, such problems can remain unresolved for extended periods of time. And when one problem is addressed, the process of fixing it can cause or worsen others. For instance, in the elementary school discussed above, past repair work on the floors had created extreme noise and dust hazards in the building. An EAT helps ensure that such repairs are made safely, and just as important, it coordinates those repairs and communicates their progress to the principal and teachers. Too often, school staff are not consulted about construction. For example, we've had situations where the maintenance staff has not coordinated the location and schedule of work with other school staff or even the principal. So a teacher might show up to her classroom one morning and find the door closed and carpenters working inside. That leaves administrators and teachers scrambling to relocate students and staff. When it comes to construction and repairs in schools, this lack of coordination is common throughout the country—but it doesn't have to be. Data transparency: Collected data regarding school buildings must be open, shared, accessible, and fully transparent so that actions can be based on real evidence. Citizen science and crowdsourcing in the form of surveys (like the one shown below): School staff must play a central role in the collection, documentation, and reporting of building condition deficiencies and related IEQ impacts, issues, and concerns on a real-time or near-real-time basis and at a sufficiently granular level—the school and classroom levels. Surveys can be an easy and useful way to identify problems experienced by school staff. Community and union participation: Those who have primary responsibility for the education, support, nurturing, and protection of our students—i.e., the adults most directly affected by the conditions in our schools—must be involved in all aspects of monitoring facility conditions and have a voice in implementing solutions. Postremediation assessment and verification: School staff, community members, union representatives, and district officials must play an integral role in verifying that remedial actions have been taken to make school buildings safe for students and staff. In any school district, stakeholders such as educators and parents can make a tremendous difference. For example, they can write to school board members, city council representatives, and school district leaders to insist that all current information about school facility and indoor environmental conditions is publicly available and accessible to all. Participating in and testifying at school board meetings, city council hearings, and other public forums is also important. While policymakers have fixated on devising ways to hold educators and schools accountable based on students' test scores, school buildings themselves have been neglected and left to languish. As someone who has spent his career visiting and assessing school facilities, I have seen firsthand the importance of educators' teaching conditions and students' learning conditions. If those conditions are unsafe, teachers can't teach and students can't learn. Improving the environmental conditions inside school facilities requires labor-management collaboration and the involvement of educators, parents, and other community members. The condition of our school buildings—and the health and safety of our students and school staff—is ultimately a social justice issue that we can no longer afford to ignore. Jerry Roseman is the director of environmental science and occupational safety and health for the Philadelphia Federation of Teachers Health & Welfare Fund. He has worked as a public health and environmental science professional for more than 30 years. 2. "Newark's Ironbound Schools: Neglected, Overcrowded and Crumbling," Education Law Center, November 7, 2013, www.edlawcenter.org/news/archives/school-facilities/newarks-ironbound-schools-neglected-overcrowded-and-crumbling.html. 4. American Society of Civil Engineers, 2013 Report Card for America's Infrastructure (Reston, VA: American Society of Civil Engineers, 2013), 8. 5. Mary Filardo, State of Our Schools: America's K–12 Facilities 2016 (Washington, DC: 21st Century School Fund, 2016). 6. David R. Day, Environmental Law: Fundamentals for Schools (Alexandria, VA: National School Boards Association, 1995). 7. American Federation of Teachers, Building Minds, Minding Buildings: Turning Crumbling Schools into Environments for Learning (Washington, DC: American Federation of Teachers, 2006); Glen I. Earthman, Prioritization of 31 Criteria for School Building Adequacy (Baltimore: American Civil Liberties Union Foundation of Maryland, 2004); and Mark Schneider, Do School Facilities Affect Academic Outcomes? (Washington, DC: National Clearinghouse for Educational Facilities, 2002). 8. Mary W. Filardo, Jeffrey M. Vincent, Ping Sung, and Travis Stein, Growth and Disparity: A Decade of U.S. Public School Construction (Washington, DC: 21st Century School Fund, 2006). 9. Carol Case and Travis Twiford, "Improving Student Achievement and School Facilities in a Time of Limited Funding," International Journal of Educational Leadership Preparation 4, no. 2 (2009); Earthman, Prioritization of 31 Criteria; Adele Willson, "Will Renovations Work for Your School Buildings?," American School Board Journal, October 2008; National Center for Education Statistics, Condition of America's Public School Facilities: 1999 (Washington, DC: U.S. Department of Education, 2000); and Molly Hatfield, "School Facilities and Student Achievement" (Portland, OR: Center for Innovative School Facilities, 2011). 10. School District of Philadelphia Open Data Initiative, "Enrollment and Demographics (SY 2009–2010 to 2015–2016)," accessed August 19, 2016, http://webgui.phila.k12.pa.us/offices/o/open-data-initiative.